Every year our Dive Planning Team take the input from the Dive Planning Meeting, puts the locations on a dart board and then throw darts to decide where we're going diving for the year. This is where we try and shed some light on the mysteries of such places as Lundy, The Farnes, Tobermory and many more besides. Underwater there are drop offs, reefs and pinnacles. Anglesey is popular for it's wreck dives and most sites are at a depth of up to 20m (65 feet) and easily accessible by boat departing from Trearddur Bay, Holyhead and other launch sites. The many coves around Holy Island are protected from the fierce currents offshore making them ideal for shore dives. Generally near to St David’s, allowing access to both the North and South coasts of that peninsula, depending on weather. There’s a number of different wrecks and some excellent scenic dives, the 1960’s wreck of the “Lucy” and the North wall of Skomer Island being popular. Depths vary, but most dives will be suitable for all. As one or the world's largest shipping lanes, the English channel is littered with shipwrecks from hundreds of years. While at times it can be exposed to the weather, and the vis can be unpredictable, on a good day, the channel offers some amazing diving. islands has provided a wide variety of wreck diving ranging from the mid-1600's to more recent years, from wooden sailing ships to steel ships. Mostly wreck dives requiring good diving experience, however there are some nice scenic dives for novices and plenty of marine life too. in Dives include the Bretagne, a upright coal transporter that went down in 1918 following a collision with a steamer, covered in marine life, and the Lord Stewart an armed merchantman was sunk on September 16th 1918 by torpedo. She was on her way to Barry from Cherbourg. It's a nice dive and a lot of anemones dead man's fingers and some congers can be seen. ​The cliffs at West Bay may seem familiar, as the village is the setting for the hit TV series Broadchurch. Excellent launch facilities with air fills on the slip and a caravan park within walking distance make for a very convenient launch site. We also launch out of Portland Harbour to access wrecks further along the Dorset coast. Weymouth is largely wreck diving though there are some scenic drift dive options if the tides don’t allow two slack water wreck dives. 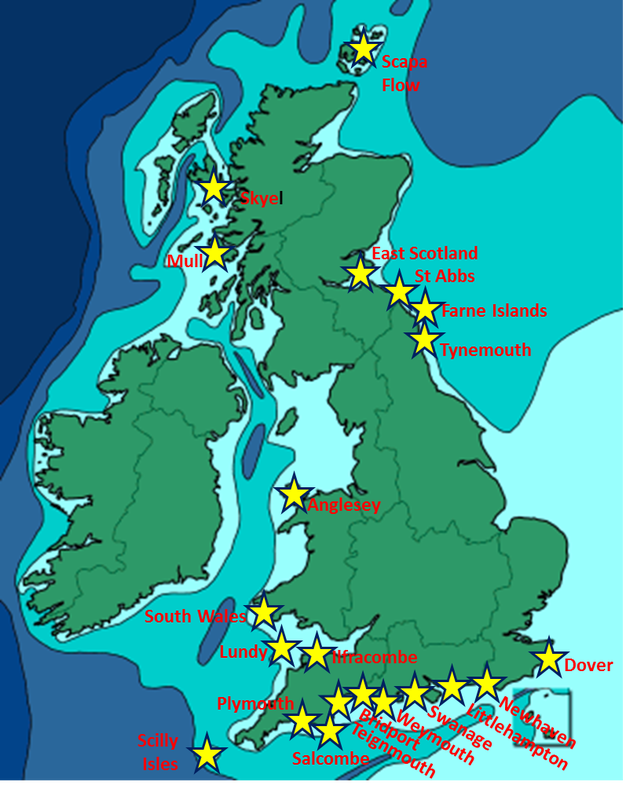 Weymouth is often earmarked as the deep diving trip (40m+) , but if demand is low from those qualified to these depths the trip is opened up to Sports divers, and looking to offer wrecks up to 35m depth out of Portland and/or West Bay. There are lots to choose from, for example a modern freighter “Aeolian Sky” and a 1930’s submarine “M2” which had a small aircraft hangar (!) and sank because of it. It’s mostly wrecks in 25 to 30m, with lots of fish generally on them. There’s also a convenient old floating harbour (a Mulberry for those who know their D Day history) which is a good scenic dive teeming with life. out to sea with little shelter, so the risk of being blown out is a bit higher. Another South coast wreck diving venue, mainly around 30m, with some very nice wrecks and again with lots of fish. The last two trips here have been excellent. Another popular venue for the club, pretty much all wreck diving with plenty of options typically at around 30m. The wrecks are generally interesting and fairly well broken. Needs some careful planning to fit around the strong tides, and to avoid the poor vis near the harbour when the tide goes out. The Farnes consist of almost 30 small islands and rock outcrops lying between 2 and 4 miles off the Northumberland coast. These islands are a favourite destination for us offering a great mix of wrecks and scenic diving. There are a couple of wrecks (the “Somali” is a big 30m one) but it’s mostly scenic diving off the islands in 25m or less, with the possibility of drift diving in some of the channels. We have seen numerous seals and diving birds underwater here. This is a little harbour on the NE coast beyond the Farnes, which offers some lovely shallow scenic shore diving. It’s ideal as a training trip or first sea trip. We’ll also take a boat so that everyone gets some boat dives over the weekend as well. It’s not just for trainees, experienced divers come just to dive, and the wreck of the “Glanmire” in 32m is a great boat dive for them. Surrounded by the Orkney Isles, off the North East tip of Scotland, this was a sheltered anchorage, where the German High Seas Fleet was scuttled after being captured during World War I. Cruisers and block ships to keep the most ardent wreck ferret happy. This body of water offers some of the best wreck diving opportunities in the world.